A long, glorious weekend… several days away from work and our daily commitments. 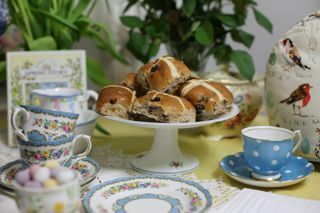 Easter is the perfect time for afternoon tea. I love to relax with a cup of tea and taking that up a level to afternoon tea can be a real treat. Afternoon tea can be extravagant or simple. Of course afternoon tea usually includes scones and devonshire cream, but as it’s Easter, I think trading these for hot cross buns is a great idea. Warm them up and serve them with butter and everyone is sure to enjoy them. 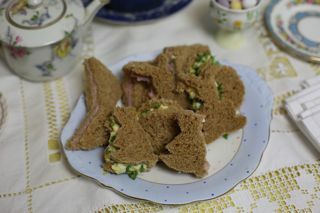 For this Easter Afternoon Tea, I’ve made sandwiches in the shape of rabbits and chicks.A lamb shape would be effective too. I’ve simply used my cookie cutters to cut out the bread first before assembling the sandwiches. I’ve used wholegrain bread as I want to make the most of nutrition. On the cakes tray, some colourful cakes set the tone for Easter. I’ve used Battenberg Cake as the check pattern of pink and yellow are so full of the promise of spring. Colourful cupcakes perhaps decorated with a mini easter egg also add some colour to the tray. My daughter and I made the easter bunting. It was incredibly easy and the results were so pleasing. We didn’t have access to any pretty card stock, so we simply tore pages from some favourite old magazines and cut them into triangles. We printed the letters, cut them out and glued them on to the triangles. A quick stapling of the triangles onto ribbon and – voila! 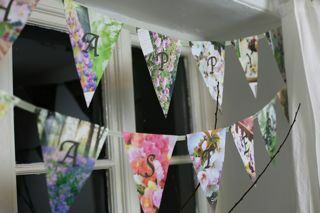 – Easter bunting! The Easter Tree was simple too. We covered the eggs in small pieces of paper napkins, brushed them with beaten egg white, left them to dry and the results were these pretty eggs. 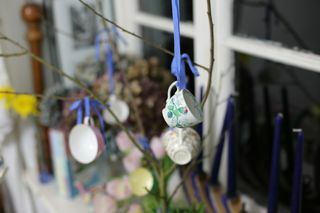 The other tree held small espresso cups that I sometimes use for tea parties with children. We had a lot of fun being creative with these simple but effective ideas. 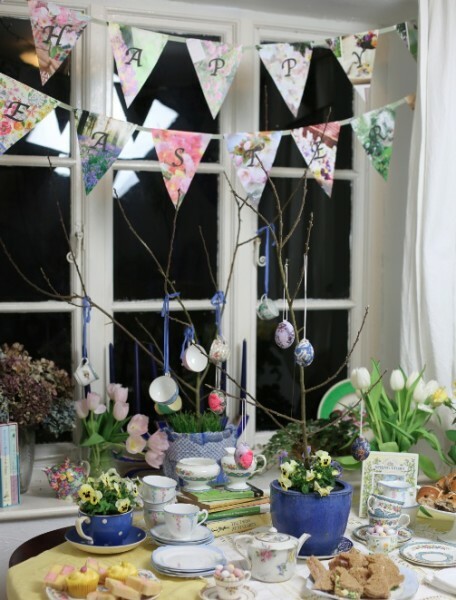 With only the addition of some pretty spring bouquets and pretty table linen, we had a wonderful Easter Afternoon Tea.You only need to use just a few of these ideas and you can enjoy a lovely Easter Afternoon Tea. Enjoy! 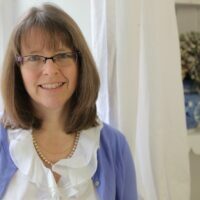 Ever since she was a little girl, Teresa has loved looking at fine china and some of her prominent childhood memories are about the beautiful patterns on the china tableware in the homes she would visit! She's been living in Great Britain for 13 years, along with her husband and three children.